The annual Opportunity Youth United Community Action Team Convening took place in December 2018, in Washington, D.C. 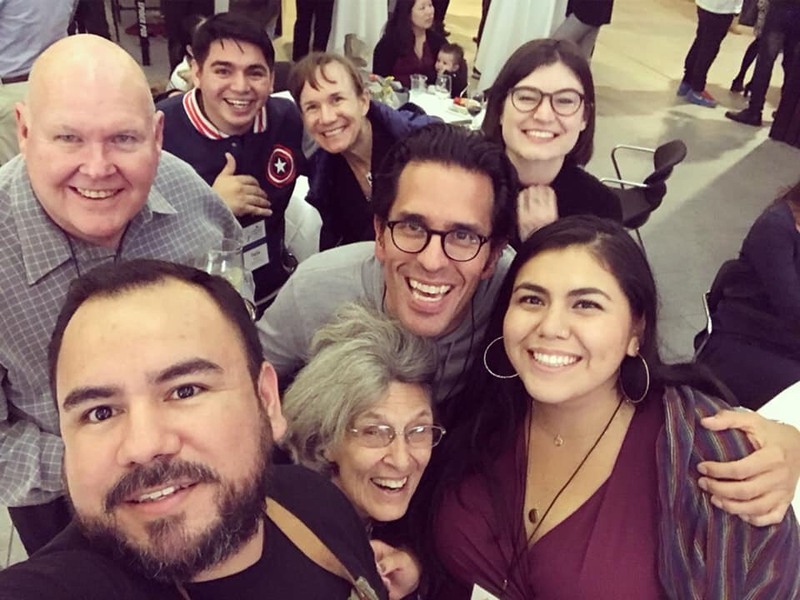 It brought three or four leaders of each of the 17 OYUnited Community Action Teams (CATs) across the U.S. together to share and build on the work we’ve done individually and collectively in 2018. CATs represented included: Atlanta, Boston, Chicago, Columbus, Denver, Greenville (MS), Los Angeles, Milwaukee, New Orleans, New York, Oakland, Philadelphia, Maricopa County (AZ), Pima County (AZ), Sacramento, San Francisco, and Seattle. The CATs gathered for three days and participated in a series of conversations, training and discussions. Lashon Amado, the OYUnited National Coordinator of the CATs, facilitated the weekend. The CATs come from different communities but face many of the same issues and share the same goal: to increase opportunity while decreasing poverty. 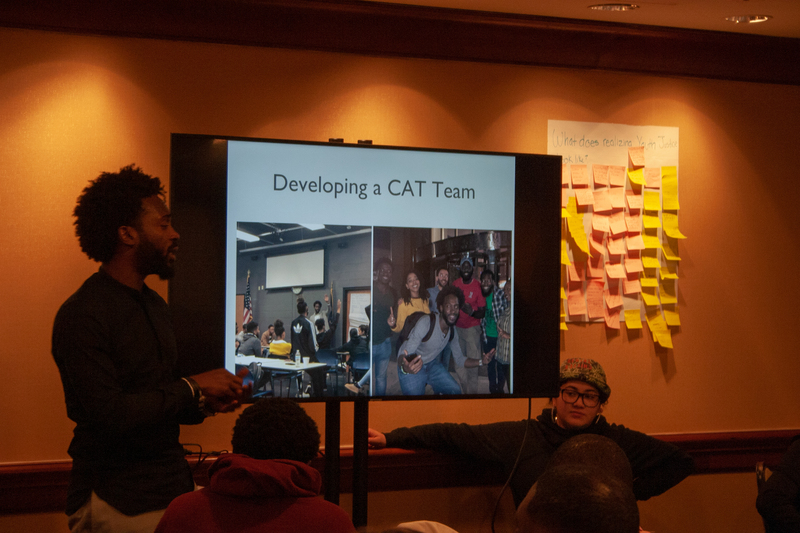 The CATs shared their community struggles and learned experiences from working with their respective communities to empower youth to become more civically engaged. Sharing stories, victories and lessons helped the CATs to learn from each other while building on the unified vision and gathering more strength to bring back the same excitement to their communities. There were about 70 of us, ranging in age from 16 to 85, but mostly in our 20s and 30s, men and women, representing urban and rural areas. We were Black, White, Latinx, Indigenous, and Asian in heritage, in keeping with OYUnited’s principle of building racial equity, healing and unity. We kicked off our convening by introducing ourselves to each other, since our Community Action Teams have grown from 10 to 17 in 2018 (and we keep growing!). Everyone formed two circles, one inside the other—those of us on the inside of the circle introduced ourselves to the person opposite us on the outside, and answered a question posed by the facilitator. Then, we switched. After speaking deeply to each other, we moved on to address another question with the next person in the circle. The questions were very deep and brought young community leaders together with more experienced community leaders to shed titles and share things that even close friends might not know. “How old were you when you became aware of racism?” “If you could change one thing in your community, what would it be and why?” These were among some of the questions asked and the room suddenly became full of conversations that were hard to stop because they were powerful, interesting and created a bond. Immediately after this exercise, CATs shared their reports from their respective cities. These reports were exciting and inspiring. During the report-outs, one CAT leader received notice that one of his youth had been shot by the police the night before. As this news was shared, the room became quiet and many were left with their mouths wide open, as if the air had been sucked out and an empty familiar feeling had been left in its place. The news felt like the perfect time to be angry, to be frustrated and to yell as loud as we could. This, however, did not happen. Why? Because, like the rest of the U.S., we have all experienced this in one way or another in our own communities. We have come to receive bad news with a kind of numbness, of despair, of unlimited grief, a deeply familiar sense of the impact of being born in the wrong city, in the wrong location, with the wrong income, and on the wrong side of town. The CAT members know that opportunities can change the outcomes for the young people they deal with. We imagine what the life of this young person would have been if he had been given the chances of a young person in the suburbs. We imagine the difference in his life if he had been presented with opportunities for education, healthcare and a chance to pursue a dream. This is the reason the CATs did not react the way most would anticipate a room full of activists might. The only way to bring change to our communities, which suffer from this and many other problems stemming from poverty, is by coming together even closer and working on bringing opportunities to the youth in our communities. Shortly after gaining our breath and coming back together, we ended the day by sharing some of the ways in which we heal ourselves and our communities. The healing methods were important since we all share the pain from issues in our communities. Some of the methods that CAT members use are long baths, deep talks with friends, yoga, time in nature, exercise, crying with trusted partners and meditation to heal and work through tragedies in our communities. We left our three days together inspired, fired up, informed, united, ready for 2019, to continue working for a better world for all.